Raise Data Recovery is applicable to many cases of logical data loss. The software helps to restore your files after an accidental pressing of the Shift-Delete button or file deletion from the recycle bin. Besides, it can retrieve lost information in more complicated situations including virus attacks or software malfunctions, system failures or even logical failures aggravated by hardware damages. 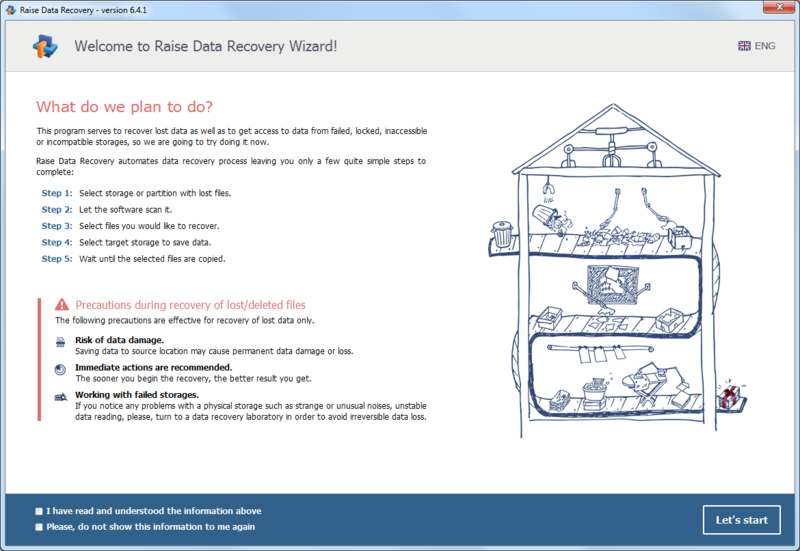 Raise Data Recovery is created for retrieval of lost and accidentally deleted files from numerous data storage media. It will restore information from hard drives of your computer or laptop, an external USB-attached storage including memory cards, USB-sticks and external drives. It can also serve as a means to get your data back from a RAID system. With Raise Data Recovery, you can be sure about complete safety of the recovery process, the highest recovery result and the minimum time you will spend for search of your lost data. 50% discount for Long-Term Support period renewal. The software employs careful algorithms for source analysis and powerful search and recovery mechanisms like those used in professional series. At the same time, it does not require special technical knowledge or skills. This style interface makes software use intuitively clear. Additionally, Raise Data Recovery will give you tips and guides in the total process of data recovery. You get your data back with no effort in next to one click. 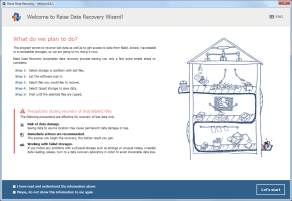 Raise Data Recovery includes software versions for all file systems types of Windows, Linux and Mac. The software automatically selects data recovery methods and recovers lost information. Raise Data Recovery doesn't require any extra user actions: the program will scan the storage space showing all found folders and the intact files that have been contained inside the file system. The application also has an optional capability to recover lost files from RAID systems of various basic configurations. The software will reconstruct the structure of an undamaged RAID array to make it available for further files recovery. The program assumes numerous variations for file names encodings. Raise Data Recovery allows setting non-standard encodings to cover the possibility of viewing file names in different languages. Microsoft Windows ®: Windows XP Service Pack 3 through Windows XP, Vista, 7, 8, Windows 8.1 up to Windows 10, both 32-bit and 64-bit. Modern Intel-compatible 32-bit or 64-bit processor. The software works in Trial Mode with limitations for copying files over 256 KB and no time constraint. * Reworked LVM module (adapted to LVM 2.2 with DM RAID); * Update to embedded viewer. * Significant update to APFS file system scan procedure; * Update to embedded viewer. * Better handling of APFS after unclean shutdown. * Fixed problem processing EXT directories with block size over 32KB. * Added few more formats for raw recovery procedure. * Added more formats for raw recovery procedure; * Detection of valid size for TIFF/QTFF formats (TIF, NEF, CR2, MOV, MP4 etc.). * Fixed problem reading expanded EXT-formatted volumes (classic+meta GD); * Fixed reading of large EXT folders after massive file deletion (when whole blocks are released). * Enhanced recovery quality from ExFAT file system. * Enhanced recovery quality from Btrfs after format; * Fixed issue with reconstruction of damaged root folder on FAT32. * One more enhancement to NTFS file system reconstruction after scan; * Significantly enhanced reconstruction of Apple APFS file system. * Enhanced structure reconstruction on NTFS file system after scan. * Added support of several new camera RAW formats (including new Canon CR3). * Fixed data recovery on FAT with zero file creation dates; * Added thumbnail preview for certain video file formats. * Fixed problem with support of small compressed files on Btrfs; * Fixed problem with GPT partition recognition on 4K-block disks. * Byte-accurate recognition of file size for JPG and MTS formats with raw recovery; * Excluded bad JPG files from result; * Displaying of partially damaged progressive JPG files. * Fixed software bug that may happen when handling EXT file system with specific superblock damage. * Support of openning EXT file system with group descriptor damage. * Fixed support of Apple software RAID. * Fixed few issues with Apple APFS file system scan quality. * Mac File System Support is extended with Apple APFS file system. * Applied modifcation to FAT32 scan procedure (related to car DVR); * Few minor bugs fixed (related to internal resources leak). * Enhanced raw recovery procedure for certain picture formats based on TIFF (including camera raw photos); * Fixed some problems and extended support of camera raw photos by embedded viewer. * Option to skip file system scan to revise existing file system contents; * Extended support of camera-raw formats by embedded viewer. * Support of HFS+ hardlinks in file system access mode. * Fixed problem with expanded EXT4 (meta_bg). * Added support for PDF, EXE and some other formats in embedded viewer. * Fixed bug with memory overflow in certain scenarios when scanning Ext4 file system; * Extended support of camera-raw formats by embedded viewer. * Extended support of camera-raw formats by embedded viewer. * Better damaged FAT/FAT32 recovery in certain scenarios. 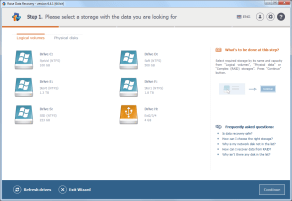 * Better deleted data reconstruction on XFS file system in certain scenarios. * Massive update to file type-based data recovery (raw recovery). * Extended supported formats by embedded image viewer (DICOM, Camera RAW); * Scan result now deafults to "All files" * Other minor updates. 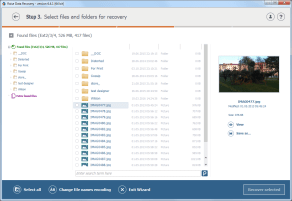 * Support of automatic connection to network shared folders under Windows 10; * Better data recovery results under 'found by type' files; * More photo formats supported by file viewer. * Separation of deleted and normal data in scan results; * Rework of different elements of user interface; * More informative and clear user interface with brighter and bigger fonts.